Motorstorm: Apocalypse is going to let players rewire the guts of the game to create their own customized multiplayer modes. 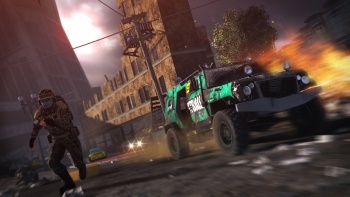 The Motorstorm series changes its theme with every successive title released, starting with off-road mountain racing and moving to jungles and glaciers, and the latest in the series takes racers into an apocalyptic city. Motorstorm: Apocalypse, expected to release early next year on the PlayStation 3, will also shake up the racing world with a very cool mode editor. Just as with most of the games that allow for some kind of customization nowadays, Evolution Studios told VG247 that Apocalypse's mode editor ... mode was inspired by LittleBigPlanet, which allowed players to create their own extremely detailed levels and share them with the entire world. The plan is the same for Apocalypse, but players will be editing racing modes instead of levels that can be shared and played online. While I love a good level editor, there aren't too many games, especially on consoles, that also let you edit a game's rules. Evolution's Paul Rutschynsky calls the editor shipping with Apocalypse "basically the same tools" as the ones the company used to create the modes included in the game. He says they will allow players to "string together a series of actions to create a consequence to string together rules to basically create and then share their own game modes online." Rutschynsky also says the editor is quite diverse and can create almost anything that users want. You can change the rules to be points-based rather than on who crosses the finish line first, or you can make cars explode simply when they bump into each other. When going online, players will be able to jump right into these homebrew modes and the best will be promoted by Evolution. It's features like this that I hope make it into even more types of games in the future. Part of what made games like GoldenEye 007 for the N64 so fun were the dizzying array of modes available to play with. Putting the tools to edit how a game works in the hands of gamers, and letting them share and play their creations together, is definitely something that would be amazing if it were to be included in other multiplayer titles like Call of Duty, though Halo's Forge comes close.